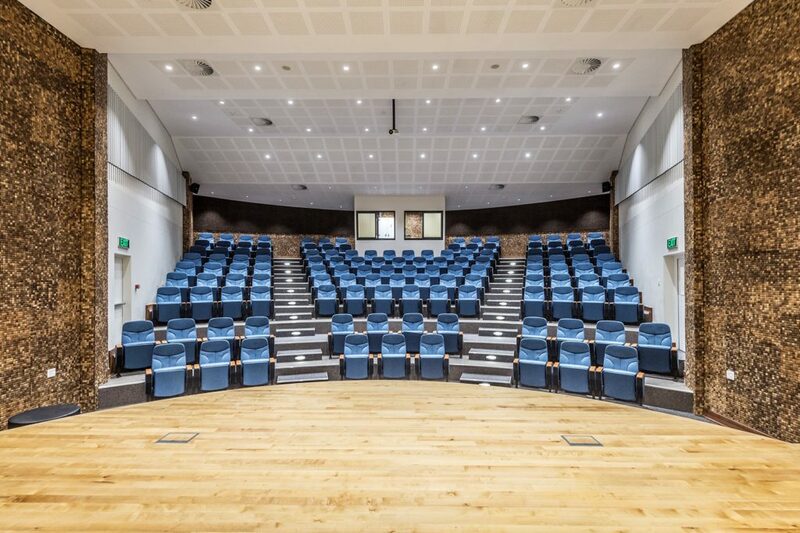 The National English Literary Museum’s 5-Star As-Built certification is a first for both the Eastern Cape and South Africa. Demonstrating ‘South African Excellence’, the project was constructed by the Department of Public Works for the Department of Arts and Culture. The total gross floor area (GLA) is 10 812 m², of which 5 851 m² is office space. Construction started in February 2014 and was completed in June 2016 at a value of R145 million. 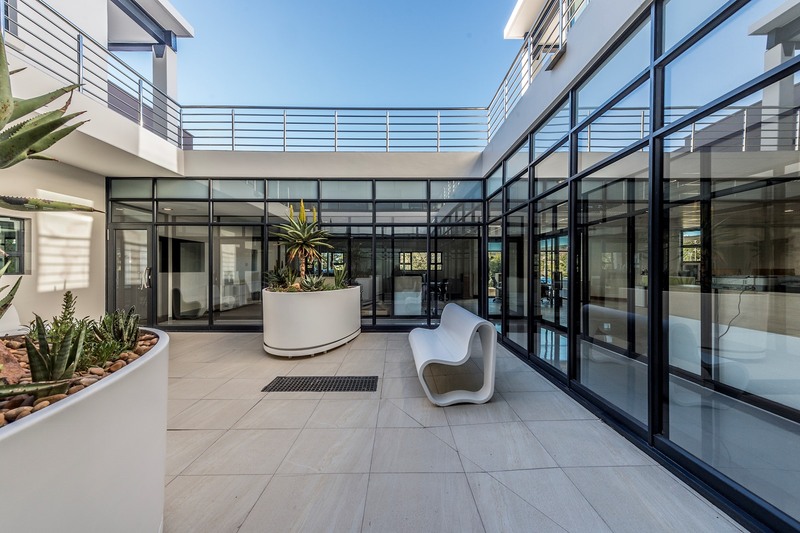 Solid Green Consulting undertook the Green Star certification process, while Intsika Architects was responsible for the design. With this building, attributes beyond cost, time and quality became key measures, such as the achievement of social objectives through job creation, local SMMEs’ and suppliers’ involvement, and the project being accepted by the broader community. Achieving this level of project success demanded a collective effort in producing a fully functional facility for future generations. The museum is situated on the outskirts of a built-up residential area in Grahamstown, and is intended to be an upgrade to an existing park. The design brief called for the building to be a highly functional landmark that would fit the site context and building typology. Accordingly, the architecture takes a sensitive approach with massing and elements responding to the human scale. Key targets of the project are cultural and educational significance, informative organisation and design, social upliftment and limited environmental impact. The development enhances the area by introducing facilities such as a mini-theatre, an outside amphitheatre, an exhibition area, archives, a library, and museum offices. The museum will not be fenced off, and provides park-like areas for the surrounding community to enjoy. Courtyards and balconies make for enjoyable outdoor breakaway spaces for personnel – and 80% of the occupied areas have views to the exterior. 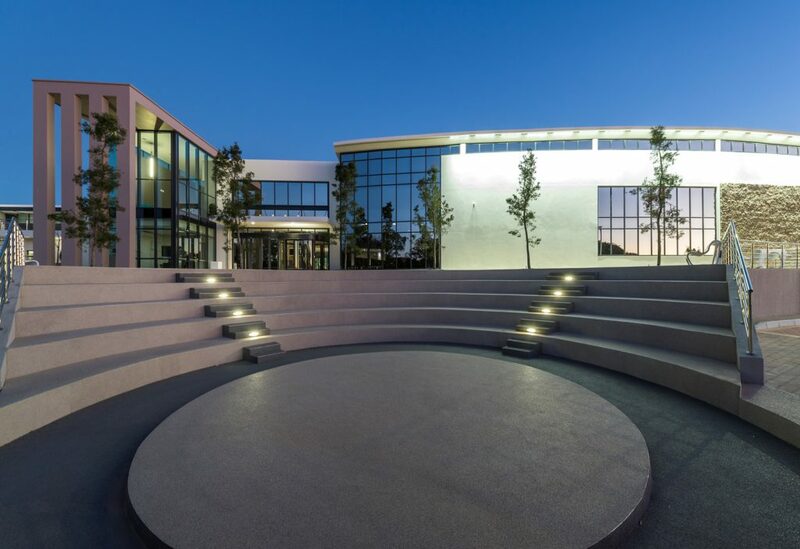 Located close to a variety of learning institutions and public amenities, the occupants of which can make daily use of the museum, the precinct is pedestrian friendly with walkways and bicycle routes. Showers and storage facilities for cyclists are available to encourage non-motorised commute to the museum. User health and wellbeing have considered by including large stair-side windows with views to the surroundings, encouraging occupants to use the stairs rather than the lift. The open air amphitheatre and mini-theatre can be used for community activities, such as street performance or book readings. 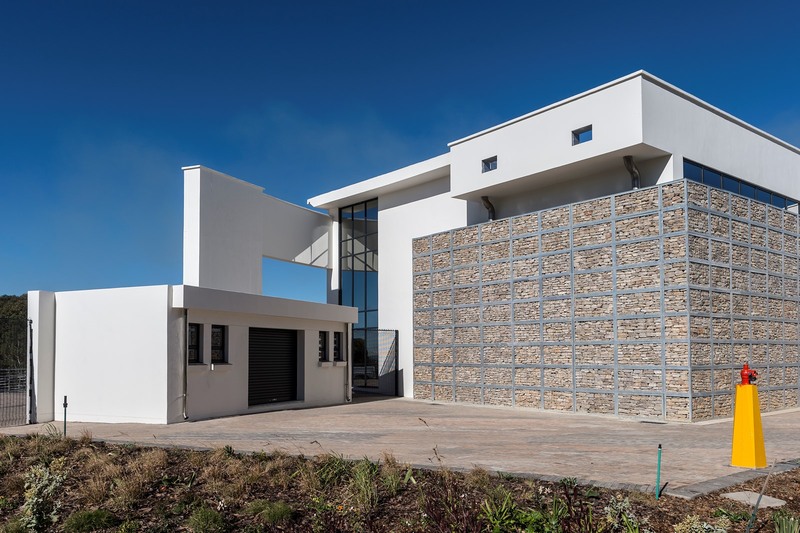 Cobus Gouws of Intsika Architects explains that, while providing education on art and literature, the building also has visual displays on sustainability initiatives – such as water and energy savings, and green-roof efficiency in the built environment. A Building Users’ Guide has also been compiled with the intention of informing users about the building’s systems. By educating users so that they may use and maintain building systems correctly, building efficiency and performance can be optimised, and the lifecycle of the building can be extended. The building aims to reduce potable water consumption by more than 95% below benchmark, and water meters have been installed to monitor and facilitate management of water consumption. Stormwater detention ponds were introduced to release stormwater gradually and prevent the erosion of the related river system. Rainwater is harvested from the roof area and used for irrigation, toilet and urinal flushing. Xeriscaped landscaping was used to reduce the need for irrigation as the garden consists of indigenous plants that are endemic to the environment. Annelide Sherratt from Solid Green explains that a Topsoil Management Plan (TMP) was implemented to guide the contractor on separating all topsoil impacted during construction, to protect it from degradation, erosion, or mixing with fill or waste. This way, 75% of the original topsoil was retained on site. Mechanical and electrical equipment was chosen for its low energy use, and a building-management system has been introduced to actively control and optimise the effectiveness of building services. The air-conditioning controllers have been strategically positioned for easy access. Each controller has a wired interface to the indoor unit serving that specific space. These controllers can adjust all user variables to provide the optimum comfort level for the space. Natural lighting to interior spaces has been optimised, artificial lights can be adjusted individually and occupancy sensors were installed to further reduce energy consumption. In addition, energy-saving heat pumps have been installed at dedicated points to supply hot water and heating systems. A unique feature of the building is the archive section, which has been placed below the ground with a green roof that insulates the building, making air-conditioning unnecessary in these spaces. And, on the north and west facades of the building, gabion walls and natural stone cladding have been used as thermal massing to stabilise the indoor air temperature. Green materials used include recycled rubber and bamboo flooring, low VOC paints, coconut mosaic wall cladding and recycled plastic carpets. Where possible, materials were reused and recycled and sourced locally to minimise transport distances and fuel consumption. From a social-transformation perspective, local labour was used where available to provide the community with a sense of ownership and generate economic upliftment. In total, 205 local job opportunities were created during construction.